The Azure Database Migration Service (DMS) is the Azure service recommended for migrating on-premises database to Azure Data platform offerings such as Azure SQL Database, Azure SQL Database Managed Instance, Cosmos DB, and Azure database services for PostgreSQL, MySQL, and MariaDB. 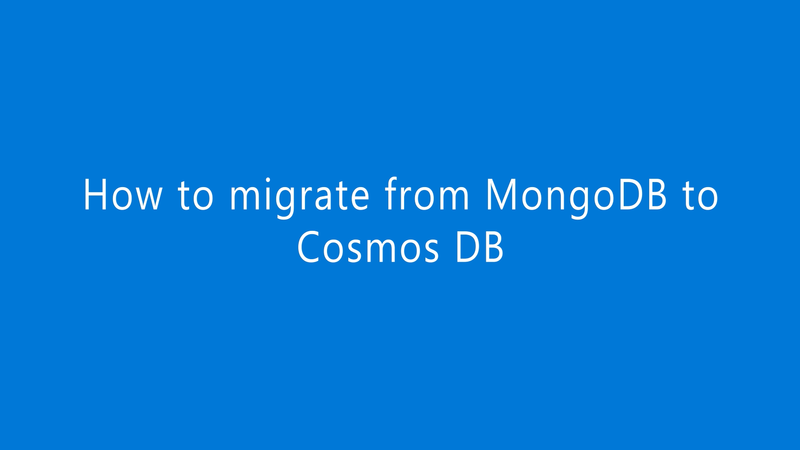 This video provides a demo of how to migrate a MongoDB database to Cosmos DB. In this technical overview of Azure Cosmos DB, learn how easy it is to get started building planet-scale applications with Azure Cosmos DB. We then take a closer look at important design aspects around global distribution, consistency, and server-side partitioning. Learn how to model your data to fit your app’s needs using tools and APIs you love. Bring your Mongo DB and Cassandra applications to Azure Cosmos DB and benefit from turnkey global distribution, and guaranteed low latency for cloud scale. Learn how easy it is to migrate your existing NoSQL applications to Azure Cosmos DB by using the MongoDB API and Cassandra API. In this session, find out about the tools used in the process, see the code that leverages Azure Cosmos DB, and learn about techniques for working around the differences between the two products. Attend this session to see the whole canvas Azure Cosmos DB covers in the security arena. We walk you through how Cosmos DB securely transports and saves the data. We share how you can use secure practice for access, authentication, key rotation, token broker approach, and auditing actions. Learn how to protect and isolate your endpoints using IP firewall and VNET integration. This session also delves into compliance and how we handle customer requests. You will leave this session confident that Azure Cosmos DB meets your security needs. In this session, learn how Azure Cosmos DB enables event driven architecture, and how to build planet-scale serverless apps using Azure Cosmos DB and Azure Functions. Users expect modem apps to offer event-driven, near real-time experiences. Now you can subscribe to changes in Azure Cosmos DB collections and trigger logic in real time while being globally-distributed, and without deploying or managing any servers.